Canned responses are automatic email responses that are used to tell senders that you may be experiencing technical problems or that you might be unavailable for a particular period of time. Almost any email services allows for canned replies. Depending on your email provider, the instructions for setting up canned replies can be different. For Hotmail email users that are interested in setting up their own canned replies, the process is really quite simple. Visit the official homepage of Hotmail to start setting up your canned replies. Start by entering your account name and password. After logging in, you will want to go to the settings section. The settings icon is a gear and should be in the upper righthand corner of your computer screen. Click on the settings icon and once the window for settings opens, click the options button. After that, go to the menu on the left and choose shortcuts. Once in shortcuts, click the button to set up the automatic reply message. The window will open and offer you a few different options. 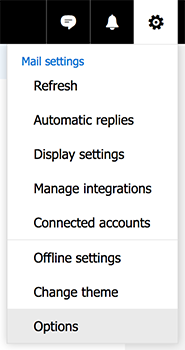 You will see options for sending automatic replies and another telling Hotmail not to send automatic replies. You will choose to send automatic replies. You will then have to pick if you will always send automatic replies or simply send automatic replies over a period of time. The second option is really the most popular and used by people that have gone on vacation. The first option may be for individuals that have switched businesses or no longer answer that particular email address. Once you understand how to turn on canned replies, you can choose when and how they are sent, in addition to customizing the message. For canned replies that are only sent during a specific time period, think about how long you will be using the canned reply. If you are away during particular times of the day, you may turn on your canned reply for just a few hours. If you are going to be away for an extended period of time, consider sending out an initial email before customizing a canned reply for your time away. Once you have all your customizations and settings selected, don’t forget to save your preferences. Now that you have set up your canned replies, your personal message will be sent whenever anyone emails your account. For more Hotmail tutorials, click here.